I received this book for free in exchange for my honest review. I was not compensated with money or goods, other than this book, in my opinion. The isolated town of Beldon, Wisconsin, is shocked when a high school freshman girl’s body is found in Lake Algonquin early in the school year. Just like everyone else in the community, 16-year-old Daniel Byers, son of the town’s sheriff, believes that Emily Jackson’s drowning death was accidental. But at her funeral, he has a terrifying vision of her sitting up in the coffin and asking for his help. Overcome with a crippling headache, he collapses, while the murderer watches, hidden in the crowd of mourners. Later that week, after another macabre hallucination while quarterbacking during the homecoming football game, Daniel begins to think he’s going insane. However, convinced that Emily’s “resurrection” was more than just a mere hallucination, Daniel and a girl from school uncover a series of clues that convince them Emily was murdered. Daniel asks for his father’s help, telling him it’s a murder, but the sheriff suspects that his son’s hunches are just the result of his growing disconnect from reality. The obstacles mount as Daniel’s difficulties distinguishing fantasy from reality become more and more pronounced. Soon, it becomes evident that his subconscious mind is synthesizing seemingly unrelated details from news articles and facts no one else notices, and then revealing the clues to Daniel through the grisly visions he’s seeing and the whispered voices he continues to hear. When the real killer becomes aware of Daniel’s suspicions of foul play, he plants evidence that leads the authorities, including Daniel’s own father, to suspect that Daniel is the one responsible for Emily Jackson’s death. Full of twists and turns, this mystery with a Hitchkockian flair will launch a trilogy of YA thrillers featuring Daniel Byers, an unlikely hero struggling to find the truth as he slips further and further into his own private blurred reality. In theory, I should have loved this book – a paranormal murder mystery is right up my alley. While I did like it, and found parts of it to be suspenseful and creepy, I never crossed over into that “can’t-put-this-down-must-find-out-what-happens” territory. I never felt like I fully connected with Daniel, the main character. Daniel is the popular quarterback who defends kids who are being picked on, is good in school, and struggles when it comes to talking to girls. A nice guy, but I felt like he never really developed that much personality. I actually thought that his best friend Kyle was more interesting and had more depth. The six months prior to the start of the story have been pretty rough for Daniel, or at least you would think they should have been. His mom unexpectedly walked out, and although she occasionally calls him, he knows she isn’t coming back, but he doesn’t know why. He talks about how sad his father is about this, but I didn’t ever get a grasp on how Daniel felt, other than some irritation when she called him. This seems like it should have been a bigger deal, but it was just sort of skimmed over. I also questioned why Daniel shared his “blurs” (a pretty clever term that his best friend came up with, meaning when reality was blurred and Daniel saw things that no one else could see) with so many people. It’s definitely not something I would have told someone I was potentially interested in dating! And other than his father who took him to see a doctor, why did no one else blink an eye? This wasn’t a book where the paranormal was normal – Daniel himself was questioning his sanity. His friends just all seemed to trust him and wanted to help solve the mystery. Despite these things, I enjoyed the creepy tone and the quick pace of the book, and I really liked that at one point or another, I considered almost everyone a suspect. I like a book that can keep me guessing! 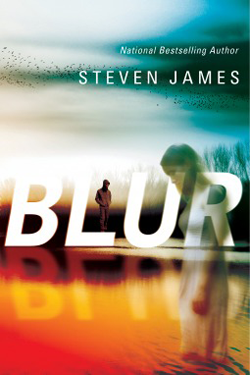 Blur by Steven James is the first book in a trilogy, and I’m very curious to see how he will continue Daniel’s story. I’m hopeful that there might be more character development and resolution of some unanswered questions. Is there more to the story of why his mom left? How will the blurs continue? Will Daniel lose more of a grasp of reality? Even though I wasn’t completely enthralled with this one, I will likely check out the next installment to find out. Steven James is the bestselling author of the award winning Patrick Bowers and Jevin Banks series. James has received wide critical acclaim for his work including two Publishers Weekly starred reviews, three Christy Awards, and being a finalist for an International Thriller Award. Steven is an active member of International Thriller Writers, the Authors Guild, Mystery Writers of America, and International Association of Crime Writers. He is also a contributing editor for Writer’s Digest. Steven lives in the foothills of the Smoky Mountains of Tennessee with his wife and three daughters.